Has the US recession already ended? This column says that it very likely has, based on evidence from the last fourteen recessions. It predicts that the NBER will declare that the recession ended in May 2009. But that doesn’t rule out the dangers of a double dip or jobless recovery. A number of economists, including Chairman Bernanke of the US Federal Reserve, have declared that the current recession is very likely over (Robb, 2009), and two reporters for Forbes (Wesbury and Stein, 2009) have dated the end of the recession to May 2009. This column adds credence to that statement by studying the past behaviour of the stock market and the unemployment rate. What does the stock market say about the end of a recession? To answer this question, I assembled a series of plots on the stock market and the unemployment rate during the past fourteen recessions. From these data, it seems likely that the NBER will decide that the current US recession ended in May 2009. 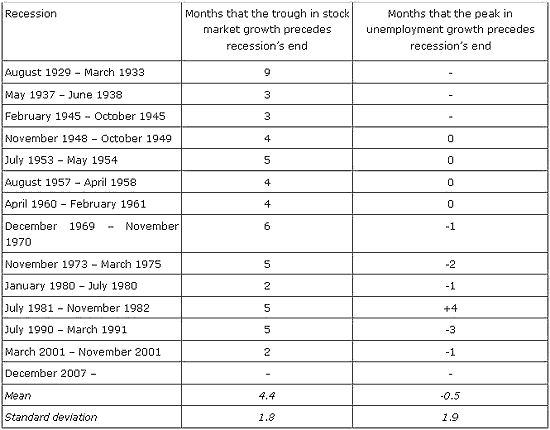 This guess is based on the fact that in all fourteen recessions since 1929, the monthly year-on-year rate of growth of the stock market changed direction an average of 4.4 months before the end of the recession, as shown in Table 1. To construct these data, I took the logarithm of the twelve-month difference of the S&P 500 and the log of the twelve-month difference of the unemployment rate beginning in 1929 and ending in September of 2009. I constructed fourteen separate charts, one for each of the fourteen recessions. The charts are labelled by the month in which the recessions began. On each of them, the log twelfth difference of the S&P is plotted in percent per year on the left axis and appears as a blue line marked by solid circles. The log twelfth difference of the unemployment rate is recorded in percent per year as a red line marked by open circles and is measured on the right axis on an inverted scale. Each variable is an annualised growth rate and is measured in percent per year. These growth rates may be positive or negative. Since the growth rate of the unemployment rate is measured on an inverse scale, lower numbers appear at the top of the right axis and higher numbers appear at the bottom. Take the current recession as an example, as graphed in Chart 14. Consider first the behaviour of the S&P 500 – its year-on-year percentage change is the blue line. A value of -50% in February of 2009 means that anyone who had bought the S&P 500 in February of 2008 and sold it in February of 2009 would have lost 50% of his or her investment. The red line is the percentage change in the unemployment rate from one year to the next. For example, in August of 2008 the unemployment rate was 6.1% and in August of 2009 it was 9.7%. In Figure 1, unemployment growth for August 2009 is 46.4% – the log difference from one year to the next, which is approximately equal to the annualised percentage change in the unemployment rate. Notice from the last chart in Figure 1 that the growth rate of the S&P turned around in March 2009 and has been climbing ever since. It is still in negative territory, which means that a year-on-year investment would have lost money. But an investor who bought the S&P in September 2008 would have lost only 10% if he or she sold a year later as opposed to an investor who bought in February, who would have lost 50%. Many economists are predicting a jobless recovery. They mean by this, that the NBER will call an end to the recession, GDP will start to grow, but unemployment will remain high. How can this be? The fact that the growth rate of the unemployment rate begins to change direction at the end of every recession does not necessarily mean that the unemployment rate itself is beginning to fall. For example, in the 1990 and 2001 recessions the unemployment rate continued to climb for a year or more after the NBER called an end to the recession. The direction of the rate of growth of the unemployment rate is a better indicator of the end of a recession than the unemployment rate itself. Figure 2 shows the relationship between unemployment and its rate of change in the 1990 and 2001 recessions. On each of these charts, the blue lines represent the unemployment rate and are measured on the left axis in percent of the labour force. The red lines measure the year-on-year rate of change of the unemployment rate measured in units of percent per year. Neither scale on these charts is inverted. In both of the 1990 and 2001 recessions, the unemployment rate continued to rise a year after the recession was declared to be over by the NBER. In the current recession, as of October of 2009, the unemployment rate is still climbing. But its rate of growth turned around in March. These facts suggest that we are headed for another jobless recovery. The NBER has not yet called an end to the current recession and, for this reason, the entire last chart in Figure 1 remains shaded. But a number of observers have claimed that the recession is over. What is the evidence for this from previous experience? A key feature of all fourteen charts is that the growth rate of the S&P turns around an average of 4.4 months before the NBER declares an end to the recession. For the three prewar recessions, we do not have monthly unemployment data, so I will exclude them from the following discussion. In four of the eleven post war recessions, the growth rate of the unemployment rate turns around exactly at the end of the recession as dated by the NBER. In the remaining seven recessions it is never off by more than four months and in all cases not by much (see column three of Table 1). To date the end of the current recession, I have combined two pieces of information. Stock market growth turned around in March of 2009, which suggests that the recession will be over four months later, in July. The growth rate of unemployment turned around in April, which suggests an end to the recession in April or May. My best guess for when the NBER will call an end to the current recession is May 2009. This is two months after the turnaround of the growth in the S&P 500 and a month after the peak in the growth rate of unemployment. The fact that the current recession is over does not mean that we are out of the woods, even if unemployment does begin to come down a year from now. The Great Depression, for example, consisted of two consecutive recessions. The first began in August 1929 and ended in March 1933. The second began in May 1937 and ended in June 1938. As the first two charts in Figure 1 illustrate, both of these recessions were accompanied by significant stock market declines. The end of the current recession has been accompanied by massive injections of public money into the credit markets and large fiscal expansions. In my view, there is a real danger of a relapse when this life support ends. Aggregate demand can be propped up by government expenditure. It can also be propped up by central bank intervention in the asset markets. When the US fiscal expansion comes to an end, as it must eventually, government demand will fall. If the Fed also chooses to end its policy of supporting the value of private assets through the purchase of long term government bonds and private securities, there is a significant danger that the stock market will fall again as it did in 1937. This will cause private expenditure to collapse, and it may lead to a larger increase in the unemployment rate than that which has already occurred. •Robb, Greg (2009), “Bernanke declares ‘recession is very likely over‘”. Market Watch, Wall Street Journal, 15 September. •Wesbury, Brian and Robert Stein (2009), “The Recession is Over“. Forbes, 5 May. Roger E. A. Farmer is Professor of Economics and Vice-Chair of Graduate Studies at UCLA. He has previously held positions at the University of Pennsylvania, the European University Institute and the University of Toronto. He is a fellow of the Econometric Society, Research Associate of NBE, Fellow Commoner of Cambridge University, and Coeditor of the International Journal of Economic Theory. In 2000, he was awarded the University of Helsinki medal. He is the author of five books and numerous scholarly articles in leading economic journals, including Macroeconomics of Self-Fulfilling Prophecies which explains how changes in market psychology can cause depressions, and his two new books on the current international economic crisis, Expectations, Employment and Prices and Confidence, Crashes and Self-Fulfilling Prophecies are forthcoming with Oxford University Press. He is a CEPR Research Associate. How Does the Greenback Perform in a Recession?